The global thermoplastic polyurethane (TPU) films market is characterized by the presence of large and well-known players, who account for over half the market. 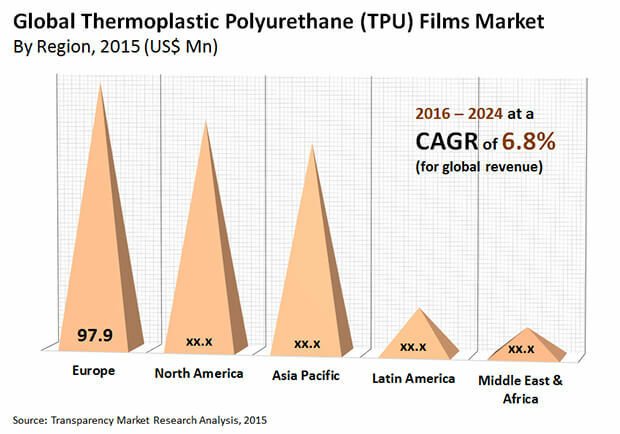 Leading manufacturers operating in the thermoplastic polyurethane films market include BASF SE, Covestro AG, The Lubrizol Corporation, Huntsman Corporation, Tosoh Corporation, Wanhua Chemical Group Co., Ltd., Huafon Group, Shanghai Lejoin Polyurethane Industrial Co., Ltd., and Polyol Macromolecule Polymer (Fujian) Co., Ltd.
Transparency Market Research has observed that key players are forming partnerships and acquiring regional players to expand the production of TPU and its raw materials. This is estimated to intensify the market rivalry during the forecast period. The capital-intensive nature of the market and the presence of well-established TPU film brands in the global market is likely to create significant barriers for new entrants. Exhibiting a steady CAGR of 6.8% from 2016 to 2024, the global thermoplastic polyurethane films market is expected to expand from a value of US$286.8 mn in 2015 to reach US$516.9 mn by 2024. The global demand for TPU films is expected to reach 79,361.8 tons by the end of the forecast period. Polyester TPU was the leading product segment of the global TPU films market in 2015 in terms of value as well as volume, amounting to US$212.8 mn by 2024. On the other hand, polycaprolactone TPU is estimated to exhibit the strongest growth in the demand and revenue during the forecast period. The segment is projected to expand at a 7.0% CAGR in terms of revenue. In terms of value, the automotive sector constituted a massive share in the global TPU films market in 2015, while the aerospace industry is likely to offer lucrative market opportunities for TPU films by 2024. Geographically, Asia Pacific is expected to represent itself as a highly attractive market in the next couple of years. In terms of volume, the demand for TPU films in this region reached 18,200.0 tons in 2015 and is expected to exhibit a 6.0% CAGR through 2024. The increase in automobile sales is projected to fuel the demand for TPU films in emerging economies from 2016 to 2024, predicts TMR. “Emerging economies such as BRICS (Brazil, Russia, India, China, and South Africa) are expected to witness an increase in GDP growth in the coming years and thus, manufacturing activities of various industries are anticipated to rise in the near future. This also holds true for the automotive sector, which is the primary end user of TPU films,” the author of the study points out. TPU films are used in the automotive industry reduce the overall weight of auto parts and components and to improve overall performance and efficiency. These films are used in the engineering and designing of noise and vibration absorbing automotive parts, such as interior door panels, seating in-fills, and thermal insulation covers for engine bays. Contrary to this, the ever-rising prices of raw materials and the growing presence of substitutes are some of the prominent deterrents to the growth of the TPU films market.